Thank you all so much for your thoughts, prayers, and congratulatory messages yesterday. We are just beyond happy that our little girl is here and healthy. What I am feeling right now is indescribable. I feel like I could burst with joy. I will certainly be posting a birth story as soon as I get a chance, but I will tell you that I'm still in shock over just how fast it went yesterday. I jumped from 6 to 10cm very quickly and probably could have had her after just 3-4hours of Pitocin. But it was a busy day in L&D for my doctor, so I just hung out while she did an emergency c-section and then delivered the baby in the room next to me. This actually ended up helping me because Brynn had even more time to move further down! And 5 minutes of pushing with no tearing? I mean, can it get any better than that!?! Our little 9lb 3oz peanut was born at 12:18pm on Monday, May 24, 2010. And she is absolutely perfect. 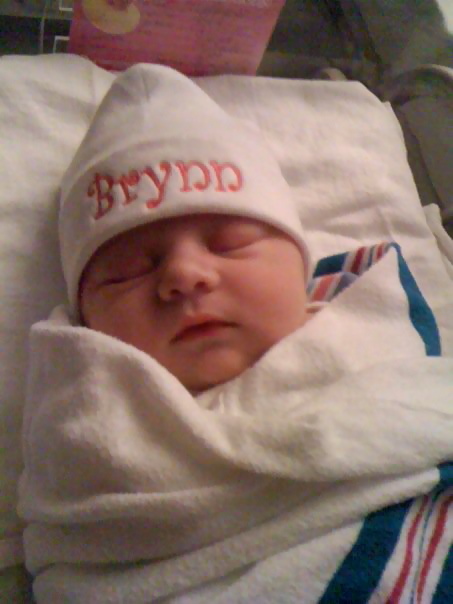 Brynn did have to spend a 4 hour stint in the NICU yesterday due to her inability to regulate her blood sugar levels. It was so hard watching her being wheeled off so soon after having her, but she seems to be doing much better now, thankfully! As for me, I'm feeling really great. Just tired. But that's to be expected. I just can't stop staring at my beautiful baby girl. She looks just like her big brother. She is so absolutely, incredibly beautiful! Praise God! :-) Congratulations Mama! Congrats! Beautiful! Glad everyone is happy and healthy! She is beautiful and I'm so glad that both mama and baby are healthy! She is beautiful!!! I'm so glad your labor was easy and she came quickly. Congratulations! oh Jenni! Im crying! She's beautiful! Congratulations! You don't know me... I am a fellow bumpie and I have been following your pregnancy on the chat boards. I am just a few wks behind you. I just wanted to say Congratulations. She is beautiful. Congrats, Jenni!!! Brynn is gorgeous!! Yay - she is beautiful! Perfect...absolutely gorgeous! So glad everyone is happy and healthy!! Congrats again! What a beautiful daughter! Congratulations! I am so happy for you! My first thought was "Wow, she is Carter's Mini Me"
Congratulations on your beautiful little girl. And wow Mama, quick labor! Oh my gosh, Jenni. I'm trying to type through tears so excuse me if I make any typos! I was crying and then when I got to the part where Carter grabbed her hand and poked her eye, I laughed out loud! Oh, how very similar are our situations. Congrats! She is so beautiful! And holy cow...5 minutes of pushing?! I am jealous! congrats! you're little peanut is beautiful! She is beautiful! Yesterday was an amazing day! Give your beautiful girl kisses from us! Aww, she's such a beautiful little girl! She just looks so sweet and perfect! Congrats again, and way to go on the 5 minutes of pushing and no tearing, that's impressive! gorgeous! And how you keep the blog world updated is beyond me! Enjoy her and the family. Congrats sweetie! new to your blog, your baby girl is absolutely precious! congrats to you!!! She's beautiful!! I'm SO very happy for you! She is absolutely perfect. So precious you can almost see heaven by looking at her face. Congratulations! Enjoy every moment of her! She is so perfect, Congrat!!!! she's so beautifgul and she's making me want a beebee! Congratulations! She's so beautiful and I just love those chubby cheeks!